And, now that it's cooling down here in Michigan, it's great to have my kitchen fill up with the scents of fall while this dish is baking ... the cinnamon and nutmeg bring about those aromas of fall for me. And, that crunch topping is seriously dangerous! This recipe yields a good amount ... probably enough for 8 - 10 servings as a side dish. So, if you're only wanting enough for a smaller crowd, you could easily cut the recipe in half ... just be sure to use a slightly smaller baking dish. Boil sweet potatoes with skins on in a large pot until fork-tender. Drain and allow to cool until able to handle. Remove skins and place potatoes into a large bowl. Whip potatoes until mostly smooth using an electric mixer or mash well with a potato masher. Add in the remaining ingredients called for in the first list of ingredients above. Combine until everything is well-blended. 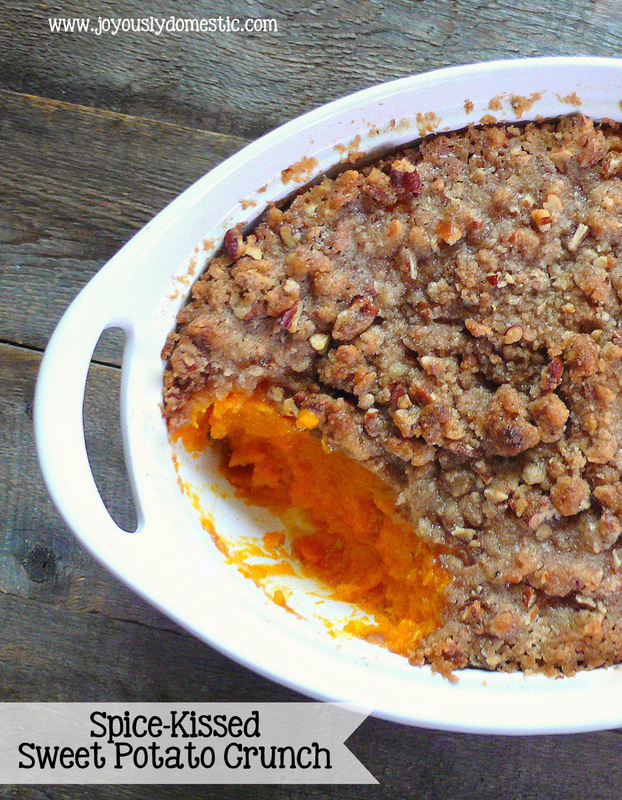 Pour sweet potato mixture into a slightly greased 9 x 13 or similar baking dish. In a small mixing bowl, combine the crunch topping ingredients until the mixture is crumbly and the butter is broken down into small pebbles. A fork works well for this task. Sprinkle the topping over the sweet potatoes. Bake for 35 - 40 minutes or until sweet potatoes are heated through and topping is beginning to crisp up. Oh, I just found your website from Pinterest today, and I love it! Love your recipes! Thanks! From a fellow Michigander, Gina (Kalamazoo area). Can this be modified to reduce the sugar and butter? I find there is too much of both in the recipe. Thanks! I can't really give you any exact ideas or precise substitutions since I haven't tried messing with less sugar or butter. Perhaps you could just lessen the amount of sugar or try subbing in some honey or real maple syrup??? As far as the butter ... I'm sure lessening the amount in the casserole would be okay, but I don't know how lessening the amount in the topping would work. Coconut oil perhaps as a sub in?? ?